Appearance-wise, the EGO Power+ 24-inch is no doubt one of the sleekest cordless hedge trimmers around. But other than that, it boasts several features that are as impressive (if not more impressive) than the competition. But does it deliver the promised results? 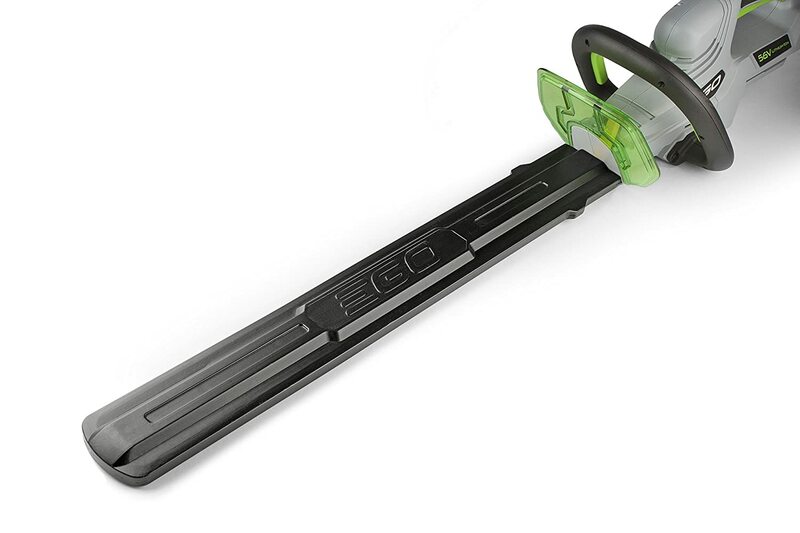 Let’s find out in this EGO Power+ 24-inch hedge trimmer review. – Battery. 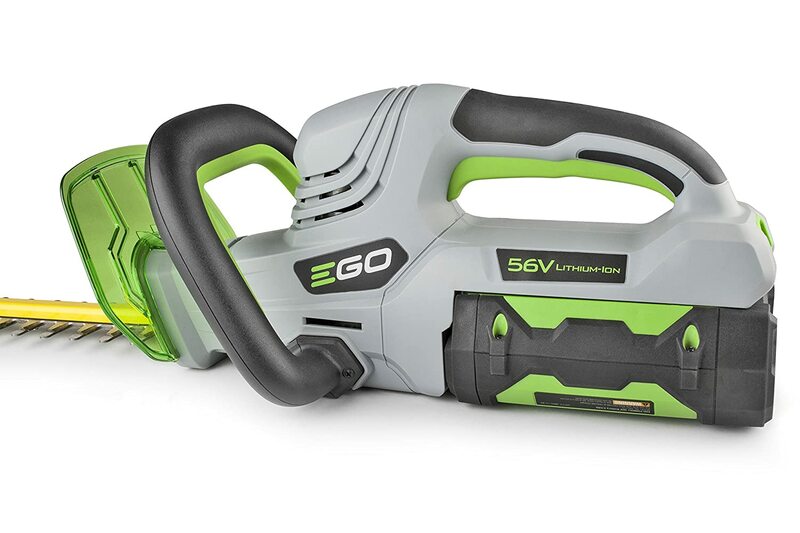 The EGO Power+ 24-inch hedge trimmer is compatible with the EGO’s 56-volt ARC Lithium battery, which the brand has described as the “most advanced in the industry.” This patended battery design is supposed to do two things – to prevent overheating, and to make your hedge trimmer run longer at full speed. According to EGO Power+, when fully charged, this battery gives you up to 1 hour of run time. – Blades. Expect 24-inch dual-action blades that are constructed from hardened steel. As advertised, these blades help deliver 3000 SPMs, and result in clean and fast cuts. 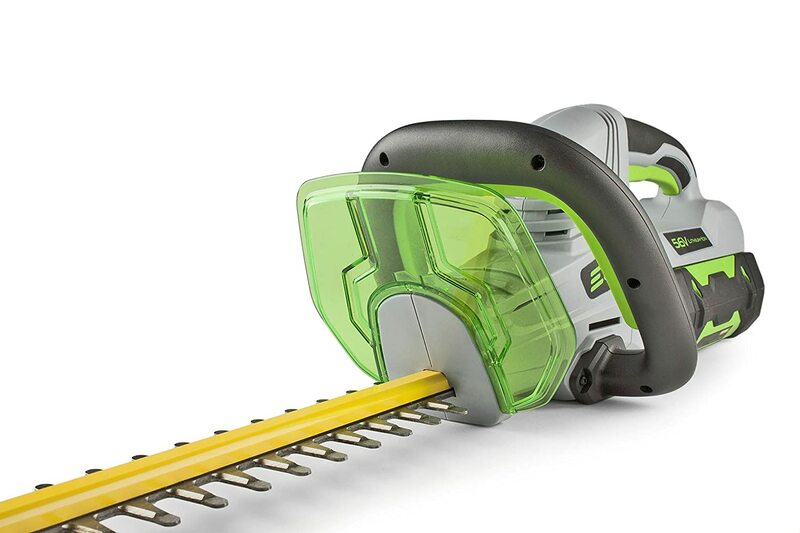 Aside from that, these blades are also able to cut 3/4-inch branches easily. – Parts. There are three notable parts to look forward to. One, this hedge trimmer comes with an electric brake. This stops the blade immediately the moment you release the trigger. Two, this unit comes with a soft-grip D-handle. Three, for your protection, the EGO Power+ HT2401 comes with a hand guard. – Weight. Without the battery, this unit weighs 6.24 lb. (2.83 kg). – Country of Origin. This trimmer is manufactured in China. How did this hedge trimmer fare among previous buyers? Here’s a summary of consumer feedback. – Battery. If you love EGO Power+ garden tools, then you’ll definitely love the 56-volt ARC Lithium battery. It’s compatible with EGO’s lawn mower, blower, and chain saw. Does it really last long? Apparently, yes. As one person has said, after finishing his trimming task, the battery still had power but he did not. – Performance. It’s easy to use. It has plenty of power, and the blades are really able to cut through thick branches easily. It’s comparable with gas-powered trimmers, except that it doesn’t come with fumes and it’s more quiet. – Weight. Some people say that this hedge trimmer is lightweight. And while others disagree, handling it isn’t a problem because this unit is perfectly balanced. – Design. The EGO Power+ 24-inch hedge trimmer‘s safety features are greaty appreciated. Aside from the hand guard, which prevents your hands from accidentally touching the blades, another big plus is its two-part trigger. When one hand comes off the handle, the unit automatically turns off. The EGO Power+ 24-inch hedge trimmer is one reliable garden tool. Design-wise, it’s well thought out. It’s relatively lightweight, it’s powerful for a cordless, and its battery can last a long time.